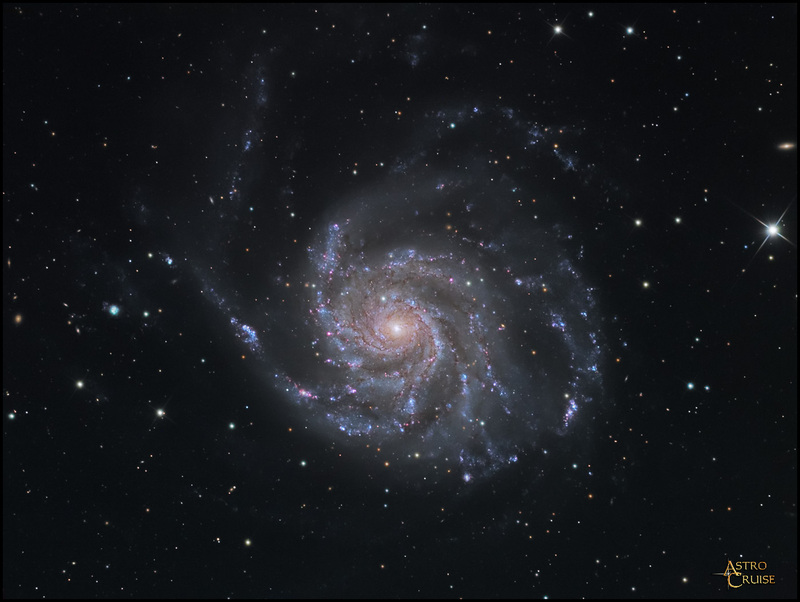 Object data: M101 (NGC 5457, Pinwheel Galaxy) is a large magnitude 8 galaxy located in Ursa Major. Photographically it is quite spectacular, however it has low surface brightness, making it difficult to observe in small instruments. It was discovered by P. Mechain in 1781 and catalogued by Messier in March the same year. Its distance is estimated at about 24 million light years. The diameter is approximately 90,000 light years and the total mass is estimated to be the eqivalent of 16 billion suns - about 10% of the mass of the Milky Way. Notes: This image replaces my image of M101 from nine years ago, taken in May 2001 from Wiltshire, England - I have removed the earlier image so if you came to this site looking for M101 this is it!. According to star measurements in CCDOps the seeing was around 1.9 arc seconds during most of the luminance exposures comprising the above image, which is exceptionally good for southern France. This is another of those images (like M51) where I was able to start with the telescope well to the east of the mount (and under the mount), which enabled me to complete the entire five hour imaging sequence without ever having to stop and flip the mount - a tremendous advantage of Astro-Physics mounts. Please see a new article on this capability.